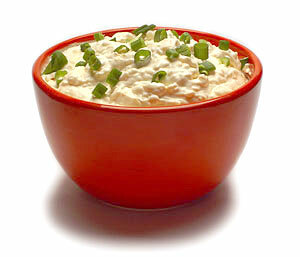 The onion dip is a dip that is delicious, with that sweet touch that enriches untemos different foods with her. One of the most common are potato chips or chips, but do not hesitate to try different foods, from crudités to chicken nuggets. There are many recipes for onion dip, this is one of those variants that arise after making several additions, or removal of ingredients, safe, every cook has his particular fried onion sauce. Can be made with cheese or cream cheese, mayonnaise avoiding incorporating herbs, providing a point with cayenne pepper ... there are many options, you can try creating your own onion dip carried away with your palate. 150 grams of sour cream, mayonnaise 40 grams, 110 grams of onion, shallot 50 grams, 2 c / c Worcestershire sauce, 1 c / c celery salt, 1 c / c freshly ground black pepper, salt taste and extra virgin olive oil. Peel onions and cut into brunoise, put a frying pan with extra virgin olive oil and onion pocha simmer for ten minutes, meanwhile, peel the shallots and chop also brunoise, stir into the pan, season to taste and cooking continued for 15-20 minutes until the onions are beginning to caramelize. Then remove them from heat and let cool. At that point, a bowl mix sour cream and mayonnaise, add the onion, celery salt, Worcestershire sauce and a pinch of salt. Mix well and test if necessary add salt or pepper. Cover the pan and let stand in refrigerator several hours to cool and the flavors opinion. Be prepared with a day in advance.